8. Position a support under the spring arm, in front of the spring. 9. Raise the front of the bar into position and fit new nuts. Tighten the nuts. 10. Tighten the nuts on the spring arm front screws. 11. 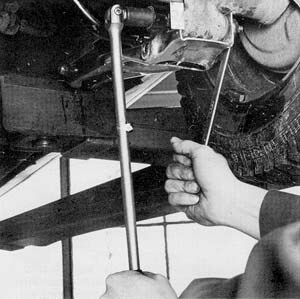 Tighten the nuts on the the spring arm reart screws. N.B The screw head must not rotate in the rubber bush in the anti-roll bar. Hold the screw head with a spanner when tightening the nut. 13. 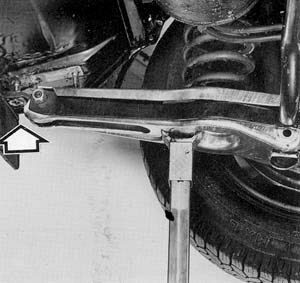 Lower the car completely and remove the tools from above the upper wishbones.